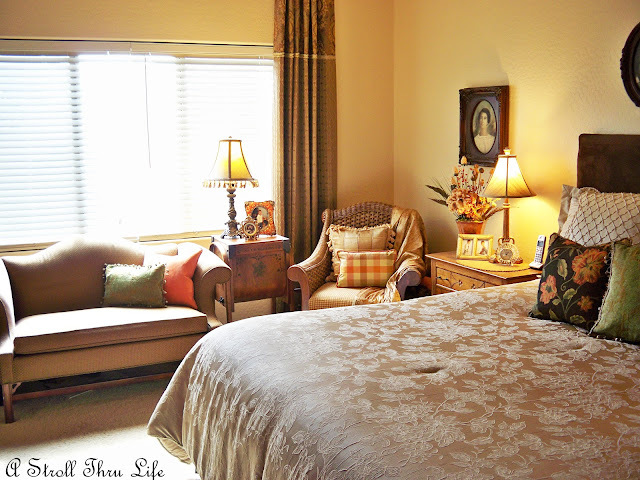 I love it when the sun comes shining through the bedroom window, it just casts such a wonderful glow on the bedroom. 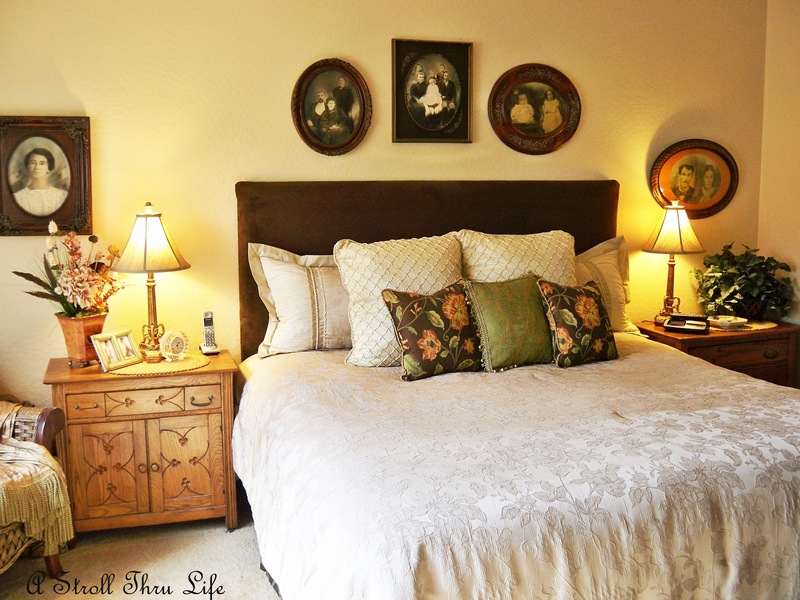 The walls are a soft beige, and the bedding and drapes are also in shades of beige and cocoa brown. But when the sun comes in through the window, everything takes on such a beautiful golden glow. Nice that it looks like we had a complete color change and I didn't do a thing. Love that. This is such a great little sitting area to read and enjoy the sunshine. One of my favorite spots. I am always amazed at how the sun or the shadows can change the look of a room so dramatically. I love your bedroom, especially the old family photos! I also love the frames in your bedroom. I like the detail. Marty, what a beautiful Master bedroom! 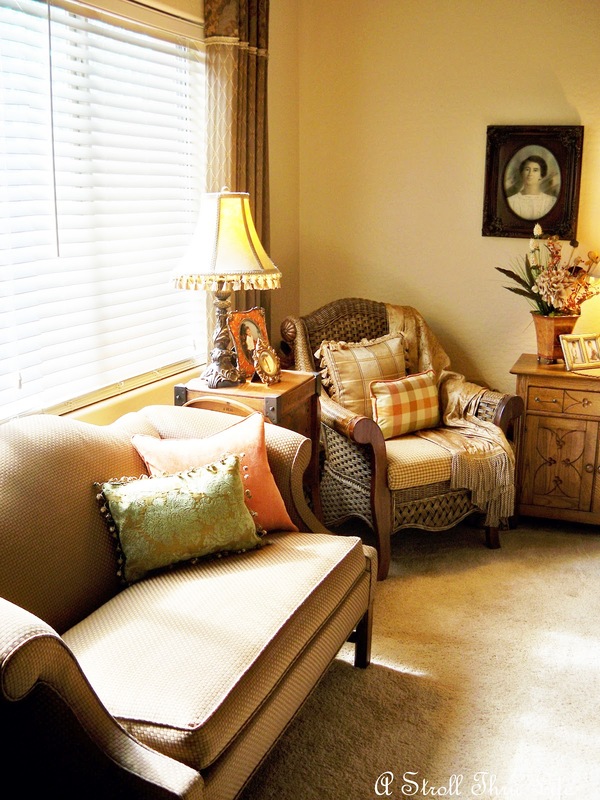 I love your sitting area and oh my, your old family photographs and frames are fabulous, what a treasure! Your bedroom is so serene Marty. I bet you sleep good there. What a lovely spot to sit and relax. The old photos are wonderful. Have a Happy Valentine's Day. Looks so lovely. I work in my basement office a lot, so it's always nice to go upstairs and see what sunshine can do for a room. Happy Valentine's Day! My favorite colors! Very pretty. Marty, your room is stunning. What a wonderful retreat you have created! Hope you have a very Happy Valentines Day. Very pretty Marty. I love the vintage pictures above the bed. I presume they are of family. What a pretty peaceful bedroom! You have a beautiful comfortable looking bedroom - sunshine or shadow! Marty your bedroom looks so cozy and comfy, it must be a pleasure to walk in there. Ok then...I'm just going to copy your bedroom as is as that is always what I've wanted my bedroom to look like! I love it! So warm, like a big hug. I would never leave that room...lol. I wish we might have had some sun streaming through the windows today, Marty! I woke up to snow flurries instead. I love the chair in the corner ~ I could just see sitting there with the throw on reading my current book! Marty, what a pretty room. The sunlight streaming in makes it so warm and inviting! Love your reading chair! I could stay there forever! Thanks for sharing. I hope you'll pop over and get in on my new giveaway! Wishing you a Happy Valentine's Day! is on all our minds. That room is just buttery warm sunshine! I love when the sun makes colors come alive. Your decorating style is pure elegance. What a restful looking room. I love your sitting area. My bedroom looks gorgeous. I love how the sun gives your room such a warm glow. Your room is so pretty and I would love to sit in that warm sun streaming in. Happy Valentine's day. I love your side tables, so pretty! Your bathroom is beautiful Marty! Love your sitting area! Your room looks like such a nice retreat. Love all your old photos on the walls. Hi Marty, Love the bedroom and especially the old pictures above the bed. I have followed your blog for a long time. I hope you will visit and join my NEW blog, just 2 weeks old. It's all about farm life, decorating. cooking, projects, and much more. Hope to see you there. Your bedroom is so pretty, Marty. I would love to have an place to sit and read. We are lucky to have room for a hamper!! What a lovely room Marty! Now following you on LF! Hope you had a wonderful Valentine's Day. I so love that Master Bedroom of yours! I love the colors, the arrangement and all the different textures you have used! Beautiful room and nice with the photos. What a cozy room; you have the most beautiful picture frames, Marty! It is interesting to see how colors change during the day isn't it? Your room looks very cozy and inviting. Love all of those neutral colors with a few pops of autumn colors added. That's so classic! Your bedroom looks beautiful, Marty. Love all the colors you chose. You were next to me over at It's Over-Flowing, & I noticed you had the same issue with the linky that I did. I can't leave an image if the linky tool is the drop-down version (like for your party), but I can when the link goes to that full-page version. I don't get it. Do you have any clues? 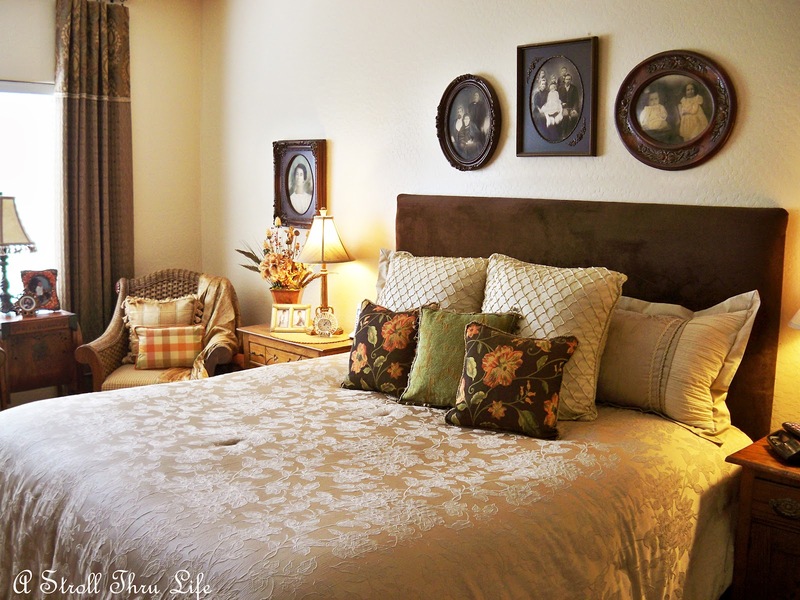 Marty, your Master Bedroom is so beautiful! It looks so warm and comfortable! 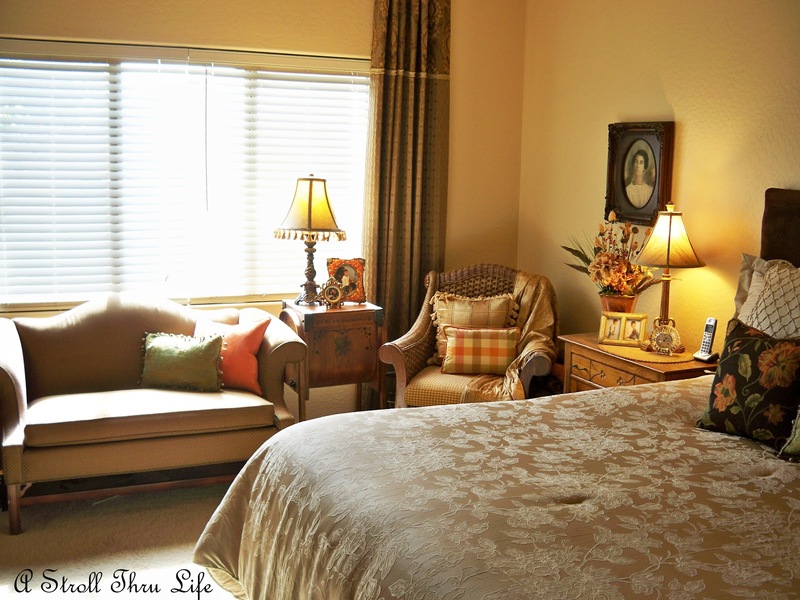 I love the chair by the window and the frames over your bed are gorgeous! Very, very pretty! I love your sitting area. Wish I had a window like that :) Found you via It's Overflowing link up! Your room is exquisite! Lovely colors. love your bedroom. just want to sit there and enjoy the light! You did a gorgeous job on your bedroom. I'm now following you, I would appreciate you following back.